Crude prices are very close to where they began the week, hiding big gains seen in fuel prices. This week, markets were focused on rising oil inventories (not including diesel stocks), though the upcoming decision from Trump on the Iran nuclear deal certainly weighed in the back of the mind of every trader. A rising dollar over the past two weeks has created headwinds for oil prices – commodities tend to trade inversely to the dollar. Still, markets were able to keep prices elevated near three-year highs, with WTI prices maintaining the $67-$68 level all week. Crude oil opened the week at $68.22, and opened this morning just a penny off from that level. Of course, there was plenty of variability during the week, with prices rising as high as $69.30 on Thursday. Unlike crude oil, diesel prices saw strong gains this week, supported by another weekly diesel inventory draw. Diesel opened the week at $2.12, opening this morning just over $2.16, the highest opening diesel price since December 2014. Over, the price gains were 4.4 cents, or 2.1%. Analysts expect diesel prices to remain elevated, as domestic refining of light crudes favors gasoline production over diesel. Gasoline also managed to remain in positive territory, though the gains were far lighter than diesel gains. 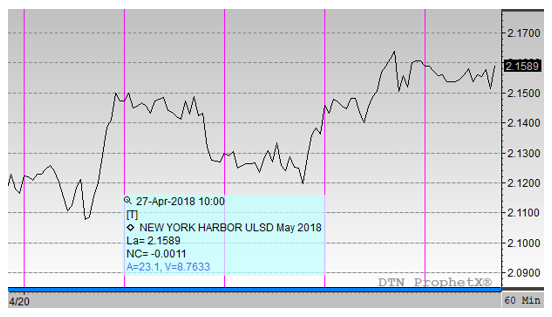 NYMEX gasoline prices began the week at $2.09, and opened this morning at $2.11. The 2.2-cent gain represents a 1.0% increase in prices this week. 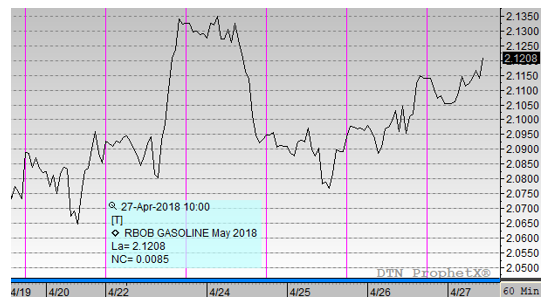 As we push ahead towards summer driving season, those prices will likely continue rising, perhaps even picking up more steam if demand maintains its record high levels.